Now this one too, since it's halfway between the Quick Fix and the Chunksters challenges. Trying to get the best of all worlds, and it should be quite challenging to find books over 300 pages but no more than 450. Will go with five to start with and see if I can go over that number. Sign for this challenge here. 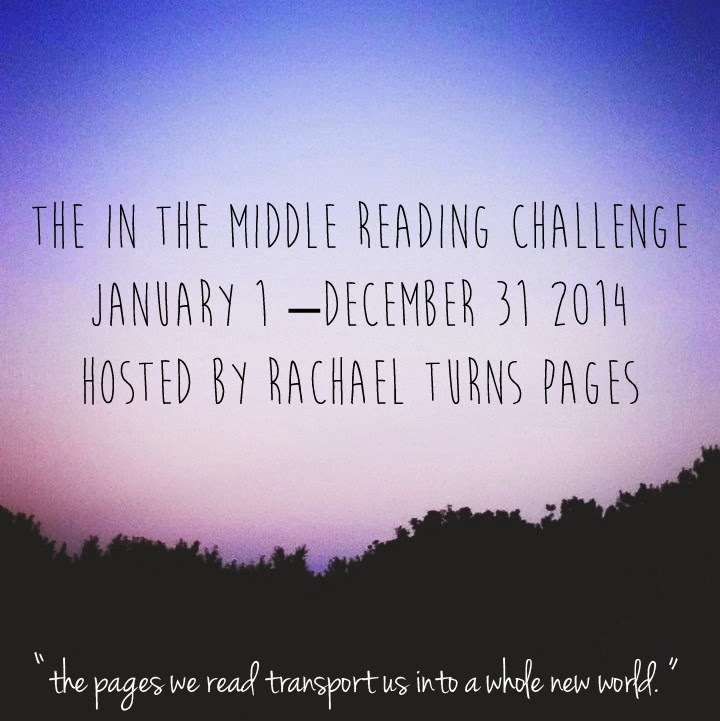 The In The Middle Reading Challenge is back for its second year. I'm so grateful to everybody that joined the challenge last year. I had so much fun watching the review list grow as readers achieved their goals to not let those books that are In The Middle be left out. The major change for this year is that books up to 450 pages will count. I realized last year that books that were from 400 pages to 450 pages did not fit into any challenge. I hope this will help people read the books they want to and not just books that complete their reading challenge goals. You do not need to be a blogger to participate although I would appreciate if you leave a comment to tell me what level you are aiming for and a link where I can track your progress. This could be a shelf on goodreads or shelfari or any other website you can think of. I would appreciate non bloggers putting their link in the linky if they can. Have Fun (as the quote in the button says "the pages we read transport us into a whole new world". Reading is about the experience and if you do not enjoy reading you will not get the full experience of the story) I want this challenge to create little stress in your mind. The Linky will be below so please be sure to sign up. Thanks to everybody who joins. Now I'm tempted to join this one, as it will be challenge to read such large books. I will try for three, but as with other challenges, may just go over. Three seems like good number to start with. There are no levels on this challenge. To sign up visit here. 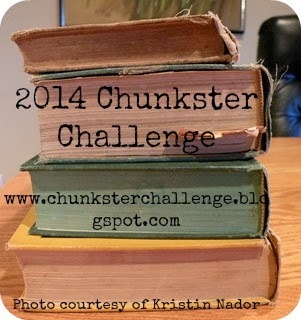 Welcome to the 2014 Chunkster Challenge! I’m your host, Vasilly. Audio books and e-books are now allowed. You want to listen to a chunkster on audio? Be my guest. Essay, short story, and poetry collections are allowed but they have to be read in their entirety to count. Books may crossover with other challenges. You don’t have to list your book ahead of time. Graphic novels don’t count. Sorry guys but reading a chunkster graphic novel isn’t the same as reading a non-graphic chunkster. I’ve been thinking long and hard about the levels of participation that have always been a part of this challenge. This year we’re going to try something new: there won’t be any levels. Don’t get me wrong. This is still a reading challenge. Challenge yourself without being locked in to a certain number. If you didn’t read any chunksters in 2013 and want to change that in 2014, come up with a number and try to read that amount. I understand that chunksters can be a bit intimidating. My goal is to encourage as many people as possible to give chunksters a try. We all love short books because we can get through them in a sitting or a few days. It’s different with chunksters. With chunksters, you have to slow down and take your time. The Chunkster Challenge is all about having fun and reading good books. All I ask is that participants either write a post or leave a comment in the comments section letting the world know your goal. Mr. Linky is acting up so if you write a post, leave a link in the comment section. I’ll be right here to cheer you on. Happy reading. Another challenge, yes, I am addicted! Sign up for this one here. I'll be gong for the first level, but may go over. Details coped from the blog below. 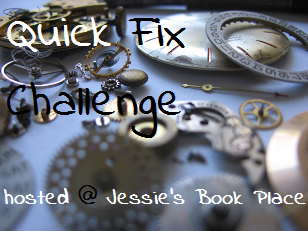 I've decided to run the Quick Fix Challenge again for 2014! I find that many times when a reading challenge has to do with a book's size it usually about reading bigger books. Sometimes, because I'm in between books, life is getting out of hand, or things are just getting in the way, there's just not enough time to read a big book. Who says bigger is better anyway? Sometimes things break and all you need is a little tape and it'll hold. So this is the "Quick fix Challenge" whether it's a love for smaller books, or just trying to squeeze in a quick read, or maybe times running out and you need to read in some more books quickly. This is a challenge about reading books with less than 300 pages. The challenge runs from January 1, 2014 to December 31, 2014. You don't have to review the books you read however if you do, you will be able to post your links to your reviews here. Books such as MG/YA, graphic novels/manga, audio, rereads, anthologies and short stories, can count toward your goal. Just had to challenge myself even more and this one seems hard to resist. And I'm going to do both. Sign up here. When facing a new year filled with so many possibilities for resolutions, sometimes it’s hard to know where to start. 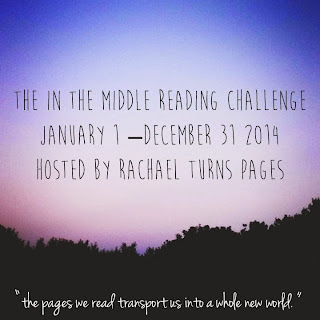 Do you want to challenge yourself to read more in the coming year? What about to read more widely? And where’s the motivation to stay on track? Bingo—that’s where! Welcome to Retreat’s Reading Bingo Challenge 2014. We’ve created a printable bingo card with 24 reading challenges! Join us and challenge yourself to read more, to read more widely and to have fun doing it all! You can approach the Reading Bingo card however you like: beginners, start by getting one line; if you’re more advanced, try the whole outside box on the card; experts, fill in the whole card! We would recommend using one book per space, but if you read a book over 500 pages written by someone under 30, who are we to stop you from cover two squares with one read? This year, for a little extra challenge, we’ve also created the Reading Bingo Card: YA Edition! We’ve come up with 24 challenges related specifically to books geared to teens. But you don’t have to be a teenager to participate! Ok, I have to do this one now. I like reading poetry too. I will go for the second level, but may go over. Sign up here. 1. Create a post on your blog stating your intention to read poetry in 2014 and sign up in Mr. Linky. If you don’t have a blog, simply leave a comment about reading poetry in 2014. Dip Your Toes and read up to 2 books of poetry throughout 2014 and leave the full link to each review (if you have them) in Mr. Linky. Wade in and read 4-6 books of poetry throughout 2014 and leave the full links for reviews in Mr. Linky. Dive in and read 7 or more books of poetry throughout 2014 and leave the full links for reviews in Mr. Linky. 3. Complete your goals between Jan. 1, 2014, and Dec. 31, 2014. Please link your reviews on the review link-up page. This challenge will last from January 1 to December 31, 2014. You can sign up anytime throughout the year. I'm signing up at the Seeker level. Different this year: I'll have a separate post with a linky for reviews. I'll keep a permanent link to both posts in my sidebar. That will be easier to keep track of which links are reviews and which are sign up posts. Use Mr. Linky to sign up below. I hope you'll join me! Read here for info on how to join. Below are the details copied from the "About" page on the Challenge Addicts blog. I fall into the "Out of This World" level of addiction as I have already joined 23 challenges and Am still considering joining a few others later. Yes, addicted for sure! So we are challenging each of you who can also say that you also are a Reading Challenge Addict. There may be random prizes and recognition for those who are meeting their own expectations by completing the challenges they've entered. We're not making this a difficult challenge, actually, it's going to be very simple! 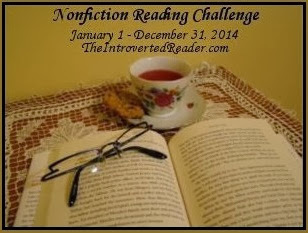 The newest edition of the challenge will begin on January 1 and end on December 31, 2014. Track all of your challenge accomplishments - good & bad. Easy, right? Who wants to be in on the fun? What else will be on offer? Random giveaways for participants to enter and unannounced special drawings for commenters on the site so be sure to leave your email address with your comment! Are you ready? Sign up on the Challenge Addicts 2014 page.